We have a crazy week coming up. Getting ready for Easter, friends in from out of town and my husband is having surgery on the 1st. I usually make all our Easter Dinner food ahead, this makes it so nice and easy once we arrive home from church. If you haven’t done this before you should give it a try. Yep, Rice Krispies! 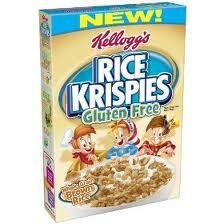 When we first went GF I bought some “rice crispy” cereal, but I wasn’t a fan. It just wasn’t the same as the original, the original has barley in it, which makes it not GF. So I was super excited when the came out with GF Rice Krispies. They are just as good as the original in my opinion. I’m not a fan of eating these as a bowl of cereal, but Rice Krispies Treats are awesome and I need these for my favorite cookie recipe. (Melissa’s Good Cookies, in my cookbook). They also make great “bread” crumbs. So, I didn’t make the GF Phyllo. I did find a great tutorial and it is a much longer process than I knew. I will attempt this at some point, but it didn’t happen this week. I did however make that coconut shrimp again. I grabbed everything I needed and headed over to my mom’s to make it for my mom and grandma. They loved it. I am seriously so impressed with what a quick and easy recipe this is. I peeled, deviened, coated, fried and served over a pound of shrimp in about 30 minutes. Oh, and made the sauce in that time too. So did any of you give this recipe a try? I also spent some time outside. I divided my aloe plants and did some other repotting. I am trying to get things ready for growing and planting. My oregano really tolerated the cold and looks fabulous. It’s ready to be harvested already. I think my thyme is gone though. It came back from last winter, but I don’t think it’s going to this time. I have so many ideas, but really need to crack down on trying to pull at least some them together. I will be attempting to make GF Phyllo dough this week, for the recipe on Saturday. I am looking forward to giving this a try. Have you ever tried to make phyllo dough? In other news, I am getting ready for the second printing of my cookbook. I’ve sold almost all of the first order. Thank you to all of you who have bought one. I tried my hand at fresh past this past week….. it was not a smashing success. First of all, I thought I could use the pasta attachment I asked for and am just getting around to trying. That was an epic fail! It would come through the machine it just kind of stalled, so that was a huge disappointment for me, it’s the reason I wanted the attachment. Ugh! I did manage to roll it out and make lasagna, but I didn’t make the double batch I was hoping to make. I may try again, I’m not sure, if I do I will take pictures and post about it. I rushed to bake before my kitchen counters were replaced and I was without a kitchen for a few days. I made oatmeal cookies and pumpkin bread this past week. The oatmeal cookies I split into three batches and added white chocolate chips and craisins to one, caramel bits to another and left one plain. The white chocolate craisin were absolutely addicting. The pumpkin bread we’ve been eating on all week, it’s great heated up in the toaster oven and smothered in butter. This week I will be making snacks for Women’s Bible Study. I plan to make Breakfast Cookies and Mini Individual Quiches with Corn Tortilla Crust. I’m going to make the tortillas homemade. At least this is my plan! I will try to get some fruit too. Have you baked anything (or plan to) really yummy recently? I’d love to hear about it if you did. Make double crust and freeze. This is a new recipe – we’ll see how it turns out, if it’s a keeper I will post a recipe. Well, my latest favorite find was at Walmart. How unexpected! In the small GF/Healthy section I mentioned last week when I shared my favorite pretzels. While getting pretzels, I see this box of cheese crackers and it’s Van’s, I was very surprised, I grabbed it and checked it out and was super stoked. 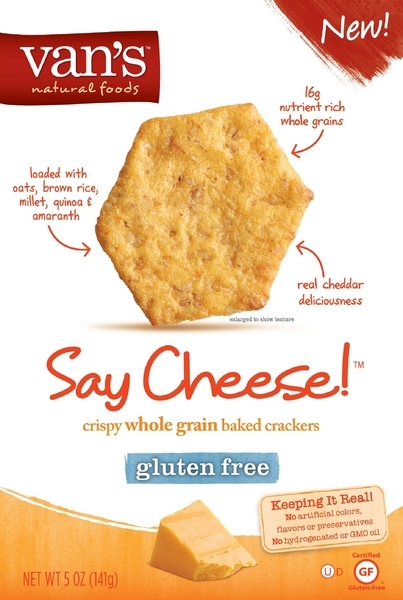 I brought them home and they are very good, cheesy, thin and very crisp. They were $3 a box, which isn’t too bad for fancy crackers in general. Even better, a couple days later I was at Earth Fare and they were on sale 2/$5 so I grabbed two more boxes.